Vincent Prieto, President and CEO of the New Jersey Sports and Exposition Authority, oversees the day-to-day operations of the multi-faceted agency. The NJSEA is responsible for the operation of the MetLife Sports Complex and acts as the regional planning and zoning agency for the 30.4-square-mile Meadowlands District. The District includes parts of 14 towns in Bergen and Hudson counties. At the MetLife Sports Complex in East Rutherford, the agency provides operational support for MetLife Stadium, the Meadowlands Racetrack, the Meadowlands Arena, and the American Dream entertainment and shopping complex, which is currently under construction. As President and Chief Executive Officer, Mr. Prieto also oversees daily operations at the Sports Authority’s Lyndhurst headquarters, which houses its Land Use Management Department, Solid Waste and Natural Resources Management Department, economic development initiatives, and sports and entertainment functions. In addition, the NJSEA works through partnerships with Rutgers University for the operation of the Meadowlands Environmental Research Institute; Ramapo College of New Jersey for school programs at the NJSEA Center for Environmental and Scientific Education; and Bergen Community College for the operation of the Authority’s William D. McDowell Observatory. As a longtime public servant and Meadowlands resident who brings vast and varied experience to the NJSEA, Mr. Prieto is well-served to move the dynamic organization into the future with an eye on balancing its vital importance to the region as both an economic engine and environmental jewel. Prior to joining the NJSEA in February 2018, Mr. Prieto proudly served as a member of the New Jersey General Assembly for 14 years. During this time Mr. Prieto worked tirelessly for New Jersey citizens and sponsored dozens of bills that have enriched and improved the lives of residents. Mr. Prieto was speaker of the Assembly from 2014-2017; budget chair from 2012-2013; and Deputy Majority Whip from 2006-2011. During his tenure in the legislature, Mr. Prieto made great strides toward positioning the NJSEA as an example of lean and strong government. 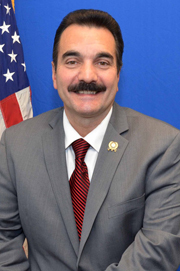 In 2015, the Hackensack Meadowlands Consolidation Act designed by Speaker Prieto was signed into law. The Act absorbed the New Jersey Meadowlands Commission into the NJSEA. Mr. Prieto’s legislation has streamlined government by eliminating redundant agencies, reducing taxes in the Meadowlands District and improving the regional economy. As a former small business owner, Mr. Prieto is keenly aware of the importance of economic development-related issues. He also possesses an intimate understanding of the importance of the region’s infrastructure. Under Speaker Prieto’s leadership the landmark Transportation Trust Fund legislation was signed into law in 2016. The Transportation Trust Fund is an ambitious infrastructure revenue program that ensures interstate and intrastate commerce thrives in New Jersey. Mr. Prieto holds certifications in Construction Code Technology from Middlesex Community College and Fire Code Technology from Bergen Community College. He is the former Construction Code Official for the municipality of Secaucus. Mr. Prieto was born in Cuba and immigrated to the United States at the age of 10. He is a longtime resident of the Town of Secaucus, where he and his wife Marlene raised their two children.